Detail of mosaic at the Philadelphia School for the Creative and Performing Arts. I've just returned from a week in Philadelphia, location of the annual summit of the Society of American Mosaic Artists. I've been a member of the organization since 2001, at the beginning of my mosaic art journey. I've watched the organization grow, along with my fellow members, these nearly 15 years. The quality of work in contemporary mosaic art has taken a steep skyward trajectory. It's exciting to be in the middle of it! In addition to basking in all the mosaic love and camaraderie of my friends and colleagues, there is always much to be learned through workshops and presentations. A significant draw that keeps me attending conferences is that it moves around the country each year. I've seen more of the country going to SAMA conferences than I'd ever seen before I was a member! Chicago, Washington D.C., Miami, Austin, Houston, Tacoma, even Lexington, Kentucky! In addition to cities I had been: San Francisco, San Diego and Mesa, AZ. It's been an incredibly rich 12 years. Here are some photographic highlights of my trip. Click on images to see larger. 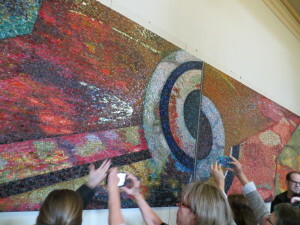 This mosaic was saved destruction in the Loews Hotel 2014 renovation and relocated to the Philadelphia School for the Creative and Performing Arts. Me and my buddy Mark Brody. Mosaic and painted mural titled "Family Interrupted." Moving commentary on living with family members in prison. Lovely Byzantine-style architecture, Ukrainian Catholic Cathedral in Philadelphia. Mosaic panel in the Ukrainian Catholic Cathedral in Philadelphia. Dalle de Verre windows in the Ukrainian Catholic Cathedral in Philadelphia. Philadelphia City Hall, in the beautiful Second Empire style. Giant pipe organ in Macy's— former Wannamaker Department store. One example of the many beautiful murals in Philly. Example of art deco polychrome terra cotta decoration. They don't decorate buildings like they used to! Giant game piece sculptures in downtown Philly. Fun Monopoly game pieces! Our table of happy revelers at "Have a Ball for SAMA", the closing night dinner and party.